Yellow gold is the colour that immediately pops into everyone’s mind when they think of Gold jewellery, however, at TJC you can discover fabulous designs and stunning jewellery pieces in both Yellow and White Gold options including 14k and 18K, depending on how much you want to spoil yourself, and if you’re looking for something different you can be sure to indulge in on-trend rose gold pieces, for an on trend twist! yellow gold is a colour of success, achievement and triumph and is a beautiful metal associated with abundance and prosperity, luxury and quality, prestige and sophistication, value and elegance and of course wealth! So whether you’re looking for an extraordinary piece for you or a special loved one, find it right here at TJC. 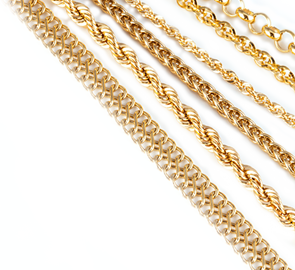 We have a seasoned collection of enticing gold pieces, including everything from gold necklaces and gold earrings to white gold engagement rings and gold bracelets, or if you’re looking for something truly remarkable find jewellery pieces with a mix of all three- white, yellow and rose gold. There are few pieces which hold similar meaning to the iconic gold ring, and whether presented to that special someone or bought as a cheeky treat to yourself, gold rings and gold jewellery in general is a staple in every woman’s jewellery box. We have crafted a range that is versatile and rich in variety, so we have styles to fit every taste, personality and occasion penned in your calendar. While yellow gold remains a timeless classic, which beautifully complements striking coloured gemstones, white gold creates a delicate look that’s perfect for simplistic every day looks and of course stunning diamond settings.